Hiking in Hawaii is an opportunity to experience the Big Island up close and personal, with sights and sounds and smells that you won't find any other way. 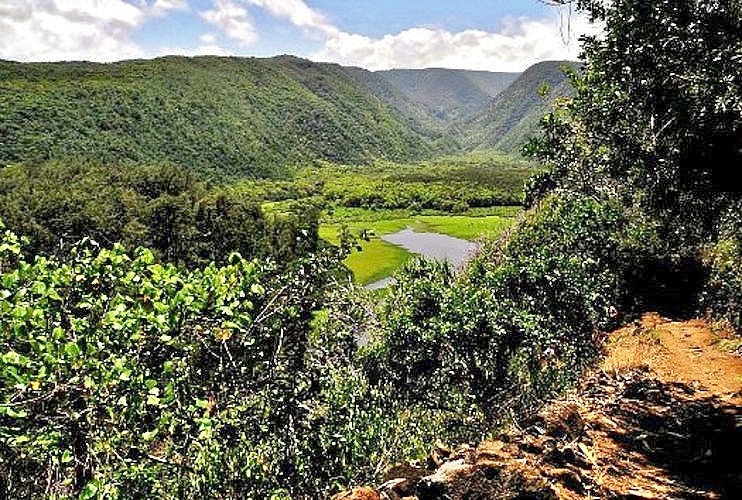 Some of our favorite Big Island hikes expose adventurers to parts of the island that are only accessible on foot, from pristine coastal trails to hiking to the bottom of a volcanic crater. We love hiking the Big Island! Excellent trails can be found all across the island. Wherever you wish to explore, there’s a good chance there is a wonderful hike in the area. Coastal hiking in Hawaii offers widely varying terrain and spectacular ocean views. 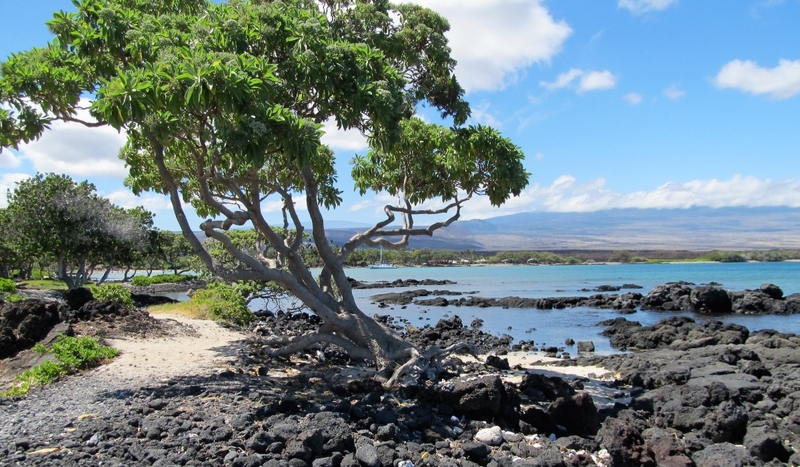 It’s possible to hike along much of the west coast of the Big Island on the Ala Kahakai coastal trail. This glorious area offers stunning ocean vistas, dramatic scenery, sea turtles and delightful swimming. One of our favorite spots on the Big Island, it’s really more of a stroll than a hike and well worth the effort. Located 18 miles north of Kona off of Highway 19. There are two ways to hike to Makalawena Beach. The easiest and most common route starts near Mahai'ula Beach at the end of a rough lava road that gets you close enough to walk twenty minutes to the beach. Closer to Kua Bay to the north, a slightly longer hike (less than two miles each way) begins on Highway 19 between the 88 and 89 mile markers. You don’t have to rent a boat or join a snorkel tour to get to Captain Cook Monument in Kealakekua Bay! We enjoy the trail from the top of Napo’opo'o Road. Roughly four miles (6.5k) roundtrip, this is a very scenic hike with a rewarding swim/snorkel at the end. 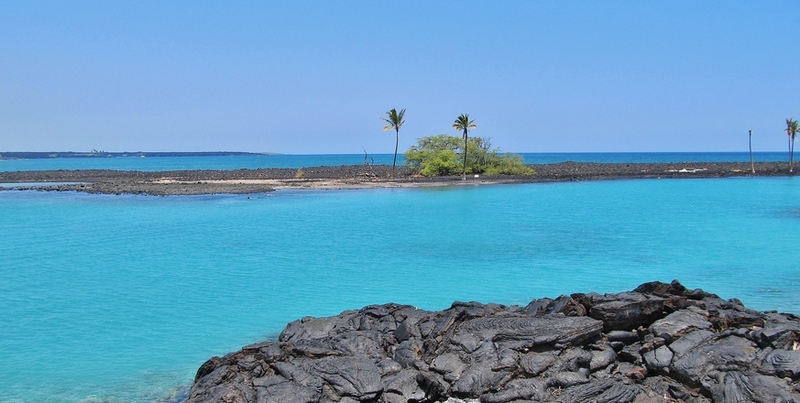 This easy hike leads to a remote and scenic white and black sand beach, 30 miles south of Kailua-Kona. It is often deserted, has nice swimming when calm, and is backed by a large grove of coconut trees. Go with a guide! Save time, save gas, and make your experience hiking in Hawaii a breeze by letting a knowledgeable guide navigate your route. Let us plan your perfect day exploring, anywhere you'd like to go. ONLY PRIVATE HIKING TOURS, just you and your guide. We'll pick you up in the morning and head to the trail, with options for breakfast/lunch and other sightseeing stops along the way. Snacks and cold drinks provided, as well as field guides to many of the Hawaii flowers and plants you may see along the way. Full-day private guided tours are just $295 for up to three people ($50/additional person). Contact us here for more details. 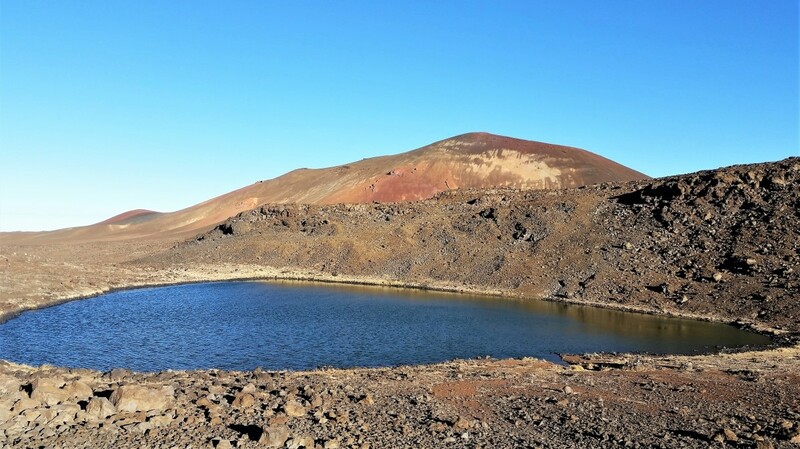 One of the highest lakes in the United States sits near the top of Mauna Kea Volcano. While the hike to Lake Waiau is relatively short, the extreme altitude (13,025 feet/3,970 meters) makes for more of a challenge. The trailhead is less than 2 miles below the summit of Mauna Kea. 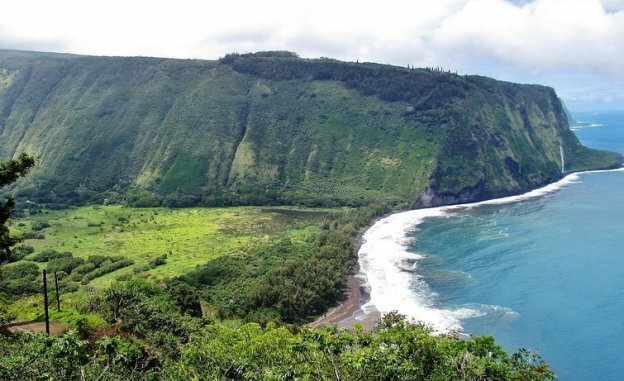 The Pololu Valley overlook is gorgeous, worth the drive even if you don’t hike. 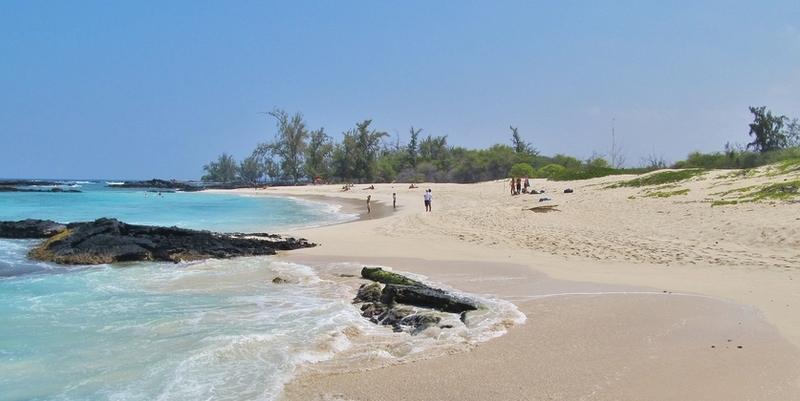 It offers a splendid view of the raw coastline on the north side of the Big Island. To get to the trailhead, from Hawi drive about twenty minutes east on Highway 270 until the road ends at the overlook. Twenty minutes west of the north coast community of Honoka’a is the overlook into Waipi'o Valley Hawaii. The overlook has a spectacular view, and without four wheel drive you’ll be on foot from here to the valley floor, where some excellent hiking Big Island really begins. Restrooms are available at the overlook. In Hawaii Volcanoes National Park, you won’t want to miss an opportunity to enjoy all the splendor of Kilauea Iki. This magical four mile loop snakes through an abundant and lush rainforest canopy before crossing the crater floor, across the remains of a 1959 Kilauea eruption. Continuing in Hawaii Volcanoes National Park, down Chain of Craters Road from Kilauea Iki, the short hike to the top of Mauna Ulu or nearby Pu'u Huluhulu provides a dramatic look at the aftermath of one of Kilauea's most persistent eruptions. 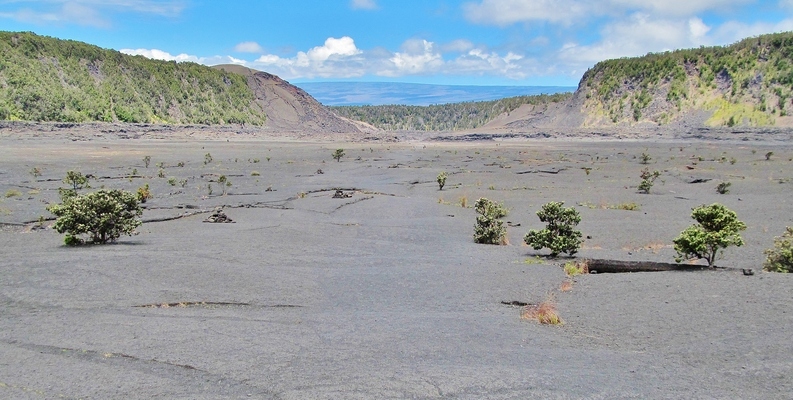 The five-year Mauna Ulu flow buried more than 40 square miles of land, including the original Chain of Craters Road. Ka Lae (South Point) is the southern-most point in Hawaii, and so also the southern-most point in the United States. 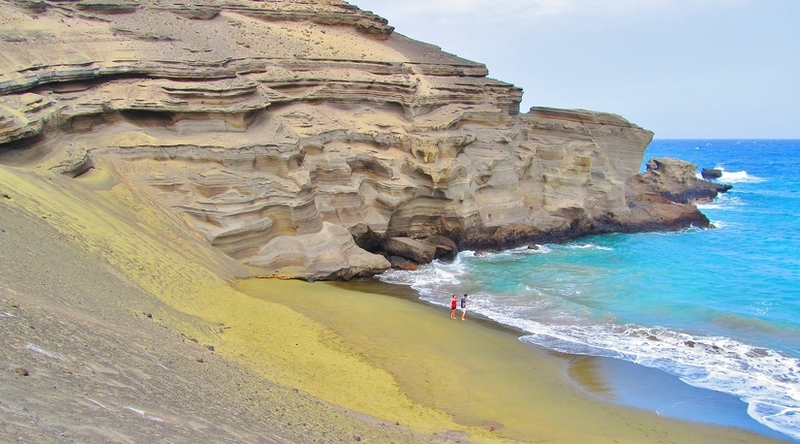 Our favorite south island hike starts very close to South Point, meandering across dusty pastureland along the coast to Papakolea Green Sand Beach. Papakolea is one of the most unique beaches anywhere in the world. Before you start hiking in Hawaii remember to always bring a daypack with plenty of water and sunscreen. Apply sunscreen 20-30 minutes ahead of your hike. Most Big Island hikes are in areas with a lot of exposure and little shade, and you won’t find drinkable water along the way. Don't forget lunch or a snack too. Insect repellent is always a good idea. Some people don't get bit, while others, well, don't say we didn't warn you. We like to also carry a headlamp, just in case our exploring gets the better of us and we stay out after dark! Be sure to bring comfortable shoes. Many people hike only in sandals. More substantial hiking shoes are probably a good idea for some of the longer hikes and walking across a'a lava. Depending on where you're hiking you might want to consider rain gear. Other clothing is optional; you can get by with shorts and a t-shirt almost anywhere you travel on the Big Island. And don't forget your camera!